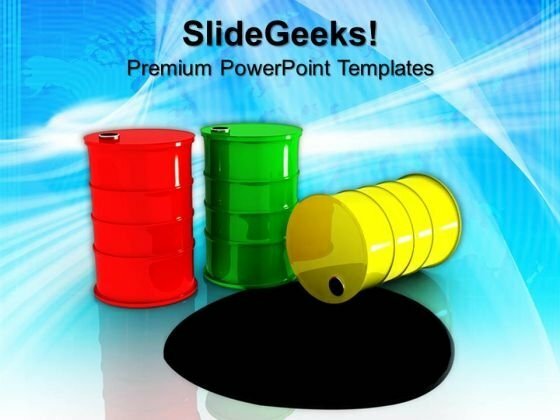 Three Oil Barrels Metallic Industry Petroleum PowerPoint Templates And PowerPoint Themes 0912-"Microsoft Powerpoint Templates and Background with three barrels and spilled oil"-"Three barrels and spilled oil, industrial, business, marketing, finance, metaphor" You like to be fair and square. Advise on the benefits with our Three Oil Barrels Metallic Industry Petroleum PowerPoint Templates And PowerPoint Themes 0912. Describe your path to success with our Three Oil Barrels Metallic Industry Petroleum PowerPoint Templates And PowerPoint Themes 0912. You will come out on top.